July 2013 - Whiteboard Consulting Group Inc. If the camel once gets his nose in the tent, the body will soon follow. 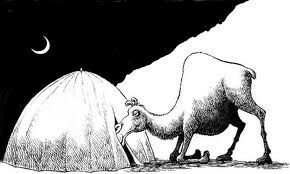 It’s a metaphor describing the belief that seemingly innocent actions can lead to larger (and unwanted) consequences – if you a allow a camel to slide his nose under the edge of a tent, pretty soon he will work his whole body under it, and you’ll have a big hairy smelly (spitting!) beast in there who won’t leave. So what does that have to do with process improvement in businesses? Plenty. Remember when we quoted Peter Drucker and said that Culture Will Eat Strategy for Breakfast? It’s the same thing… your process changes are like your revised strategy, and your organizational culture must be aligned in order to ensure the improvements can be realized. A lack of accountability to process changes is the thin edge of the wedge, or “the camel’s nose.” Allow slippage with respect to process adherence, and you are begging for trouble. Add process accountability to job descriptions and performance contracts. You know the old adage, “what gets measured gets done”. It applies here too. If your team members are measured based on their compliance with processes, then it’s likely they will comply! Now get the commitment. Provide the background story on why the process changes were made and why it’s good for the organization. Communicate the way your team needs to hear it (more on that here) – if they understand it, they’re more likely to commit vs. simply comply. Coach and Share. If that camel sticks his nose under the tent and you notice it, then coach immediately. In the same way, if you notice commitment, recognize it right away! Share successes! 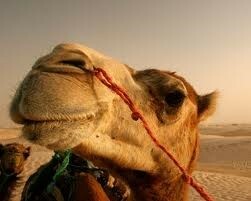 Have examples of camels’ noses at your office? Share it with us! Give us a shout via Twitter @whiteboardcons using #betterfastercheaper or email us at info@whiteboardconsulting.ca/staging. Recently we’ve been closing off a few older projects and starting a few new ones, and the issue of effective communication keeps coming up. A LOT. It really doesn’t matter whether it’s a brand new initiative or one that’s well on its way to closing – communication has a special role in all stages of a project. When teaching our Project Management course, we emphasize the need to link back in with all stakeholders and share the results and intended next steps BEFORE closing a project. With new projects, it’s important to ease people into a project and let them know that you are there to help. In fact, we always stress the need to engage employees throughout a project or process improvement exercise, and it has to be consistent. Timing is key. If you communicate too early (before solidifying your ideas and establishing what to say and how to say it) you might confuse your audience. If you communicate too late, your new idea has a high risk of falling apart. (People won’t know what’s happening, and thus no actions will take hold.) Plan ahead. Create a communication plan. Everyone is different. Consider your audience. Are they visual learners (i.e. they absorb information best with face to face presentations (body language), illustrations, videos, graphs, etc)? Are they auditory learners (i.e. they are absorb information best through talking and discussions- face to face is not required)? Are they verbal learners (i.e. they think in words rather than pictures – eMails work well with this group)? In all likelihood you will have a mix, so craft your communications plan so it addresses all three. What complicated messages did you have to share? Tell us about them! Give us a shout via Twitter @whiteboardcons using #betterfastercheaper or email us at info@whiteboardconsulting.ca/staging. If you’re of a certain age, you may remember the 1970 hit “Signs”. The chorus, in classic 70s style, is both angry and sarcastic in its protest against the overuse of signs (which hamper freedom and discriminate against “long haired freaky people”). Blockin’ out the scenery, breakin’ my mind! So that was 43 years ago, and I’m here today to tell you that I think signs are awesome, helpful, and when used properly, save a lot of aggravation. Namely, mine. I enjoy travel, and while I manage to leave the business back home in Nicole’s capable hands, I still can’t shake my tendancy to analyze (over analyze?) business processes everywhere I go. One of the things I am constantly struck by is the poor use of signage and its impact on the customer experience. *On a recent cruise, I arrived at the port area in Venice with a group of similarly travel-weary people. Greeting us was an enormous terminal with maybe two signs, neither of which were helpful in pointing a person to the right area. In fact, the signs were not in use at all, which was a shame since they were just standing there taking up space. Dozens of people dragged heavy luggage to the wrong area, only to be redirected by a harried staff member. PUT UP A SIGN YOU IDIOT, I wanted to yell, but didn’t. *Many of the cafés in Italy require you to pay for your purchase before ordering at a different counter. I’ve only seen one café that actually had a sign to let customers know this. You can imagine the chaos that ensues every single lunch hour in absence of a sign. At least for the tourists. *Be short and yet abundantly clear. *Be visible and easy to spot. To provide direction. Point the way for your customer. Have signage at all corners, intersections, and stairs so they never have to wonder which way to go. To set expectations. Let your customers know what they need to have in hand when they meet with you (specific paperwork or documents?) and how long the process will take. To give instructions. Tell the customers where they need to go, and in what order they need to do things. To share information. Provide interesting information to increase the customers’ understanding of your business processes. Tell them why things happen the way they do. To say thank you. No harm in posting a thank you note for your customers at the end of a process. Thank them for their patience, their business, their sense of humour, and their time! PS – don’t forget that your employees are your (internal) customers too, so signage works in the office in the same way! Have examples of signs that work? Share it with us! Give us a shout via Twitter @whiteboardcons using #betterfastercheaper or email us at info@whiteboardconsulting.ca/staging. So often we gripe to you about how organizations need to document and build processes in order to be successful, but what about when an organization has too many processes or is too rigid about them. So today’s blog is about “Overprocessing” (that’s not too much hair dye in this case). My best friend (henceforth known as bestie) and I often go to a nail salon in our neighbourhood. It’s a bit of a catch-22. We love it because you can always get in, you never have to wait, you are in in and out in 30 minutes or so, and it is extremely reasonably priced. On the other hand, their processes are so rigid that they often alienate us as customers. We’ve affectionately named them “Military Nails”. Now as a consultant, I’m pretty sure I have their business model down. No frills, low cost, fast nail services. They get you in, you pick your colour, you get your pedicure, and then you get your manicure – FAST. They don’t do designs, they don’t do paraffin wax treatments on your feet – they have their processes nailed, and it is successful. If you want a fancy spa-like treatment, you just go somewhere else. If you want something reliable, fast, and cheap, you go to “Military Nails”. But occasionally, I wait for bestie to arrive in the hopes that perhaps we can sit near each other and chit chat during our pedicures, or catch up on the latest news. This seems to throw the Military nails people, they get confused, wonder why I won’t sit down yet, or they force me to sit in their waiting room (instead of standing as I often would). Other times, we see a new nail design in a magazine and see if they can do it (the technicians are incredibly talented) – but this usually results in a great deal of approvals from their manager, reiterations about costs, and it becomes a bit of an unpleasant experience. So how can you ensure that your organization has processes that work and deliver services to your customers the right way? 1) Your processes focus on processes, not on your customers. Focus on your strategic vision, if it is to be “no-frills” then keep it that way, but think about how the outcomes can affect your customers. 2) Your processes require burdensome approvals. Make sure that your employees have autonomy to make decsions that appeal to your clients, while still meeting that strategic objective. Have examples of over processed organizations? Share it with us! Give us a shout via Twitter @whiteboardcons using #betterfastercheaper or email us at info@whiteboardconsulting.ca/staging. Are You a Great Coach in the Office? Have you heard about the concept of being a coach at work and wondered a) what does it mean, and/or b) why the fuss? Well, let’s start with the coach of a sports team. What does she do? Well, she focuses on an individual to build on their strengths, help them overcome challenges, and perform as part of an amazing team that wins games. Now. The coach at work. Well… it’s pretty much the same. He focuses on an individual to build on their strengths, hep them overcome challenges, and perform as part of an amazing team that delivers results for the company. More and more businesses are realizing that management is more than task-based directive behaviour. Effective coaching leads to more engaged employees, and research shows that engaged employees lead to happier customers which of course leads to improved business performance. So that’s “why the fuss”. Do I know what it’s like to work for me? This is a tough question – do you know? Have you asked your team? Would they be honest with you? A formal 360 survey is one way to find out. If you have a good relationship with them, you can do an informal, anonymous survey as well. Am I aware of the impact my moods have on my team? You may have a bad day and try to shelter your team from it, but storming through the work area on your way to your office is going to give off a vibe. If this happens frequently, it will impact your approachability. Do I refer to my employees as my “staff” or my “team”? Think about this. Doesn’t it sound nicer (and more coach-like) to refer to your “team”? Am I aware of the difference between coaching and performance reviews? All performance review discussions should contain an element of coaching. But all coaching is NOT performance-based. This is a very important thing to remember. Do I take advantage of “coachable moments”? This is a great phrase to work into your business vernacular. It helps the employee’s awareness that they are actually being coached, and they actually listen a little bit harder. It also helps your awareness of casual opportunities for immediate coaching. Am I kind and curious? I worked with an amazing coach who taught me that kindess and curiosity leave no room for anger and resentment. Click to Tweet It’s so important to consider this before jumping to conclusions about an individual’s performance or behaviour. Do I know things about my team that aren’t work related? Do you have casual coaching in the form of discovery conversations? Do you know their spouse’s name, how many kids they have, and what they love to do on the weekends? This kind of information is important in establishing trust. Do I avoid difficult conversations? Oh we all hate these. You have to talk to someone about an outburst, a body odour issue, or a performance problem. Avoiding confrontation is so natural, and yet so damaging to an effective coaching relationship. Properly handled, these conversations can build your relationship. Do I provide praise and feedback in equal measure? I don’t want to advise you to provide the “kick with the kiss”, ie. to provide a compliment at the same time you provide difficult feedback. No, it’s best to be blunt and get the feedback out there. But also be aware of opportunities to praise! Do you know a great coach at work? Share it with us! Give us a shout via Twitter @whiteboardcons using #betterfastercheaper or email us at info@whiteboardconsulting.ca/staging.